"Concussion" is one of the scariest words ever in youth sports. But, knowledge is power. 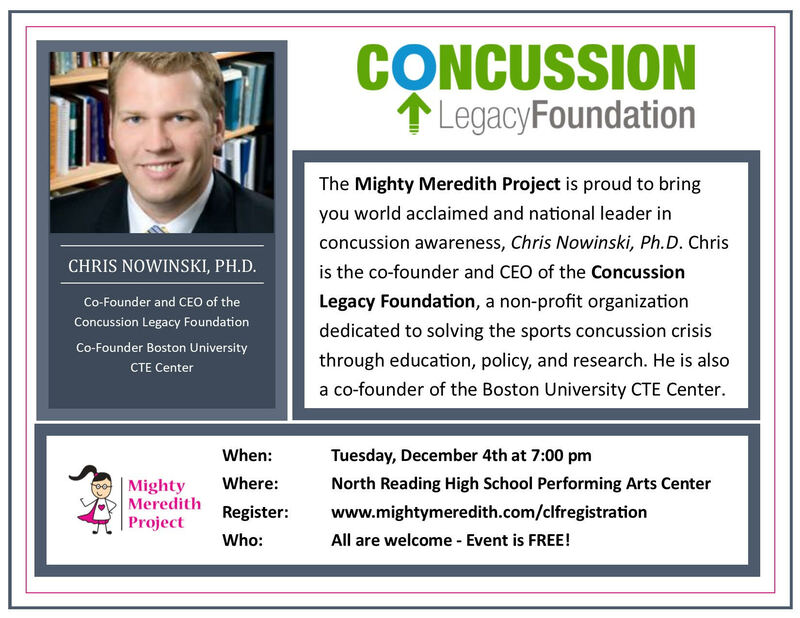 So, the Mighty Meredith Project is excited to announce a free discussion from Chris Nowinski, Ph. D. Chris is the co-founder and CEO of the Concussion Legacy Foundation, a non-profit organization dedicated to solving the sports concussion crisis through advocacy, education, policy development, and medical research. The CLF is dedicated to advancing the study, treatment and prevention of the effects of brain trauma in athletes and other at-risk groups. Chris is also a co-founder of the Boston University Chronic Traumatic Encephalopathy (CTE) Center. Chris’s talk should be of particular interest to all student athletes and their families, athletic directors, youth and secondary school sports coaches, as well as the general public. Join us Tuesday, December 4th at the North Reading Performing Arts Center, 189 Park Street, beginning at 7:00pm. The event is free, but registration is required at: https://www.mightymeredith.com/clfregistration.